While there are many cases where a shipper will actually load a pallet for the customer, there are also many cases where the customer actually does the loading of a pallet on their own prior to shipping. Either way, it is important to understand a few basics when it comes to loading a pallet in a safe, efficient and reliable way. For example, prior to loading any pallet, it is key to note that there is definitely a proper way to do the loading. It is also worth understanding that there is no real set standard when it comes to pallet size in the United States. That said, in most cases a typical pallet can be expected to be around 42 to 48 inches on each side. In many cases pallet size is determined by the capacity of the actual shipping container and where it will be placed. For example shipping containers can be placed in aircraft, boats, trains or trucks. All of these factors can have an impact on the actual size of pallet that is used. Pallets are obviously square and that is because they are sized to fit snugly against the side of the container where they will be held. This helps to maximize the amount of product that can be loaded. Also note that many companies and manufacturing firms will box items as a way to maximize the use of a given pallet. In other words, when boxes are standardized and properly sized more products can be placed on a single pallet. This helps to reduce waste while maximizing product load capabilities. As an added bonus, boxes while designed to maximize the load are also created in such a way that they are attractive to customers. When actually loading a pallet it is first a good idea to thoroughly inspect the pallet for any defects or potential problems. Look for signs of rotted wood or other types of damage in the case of plastic pallets. 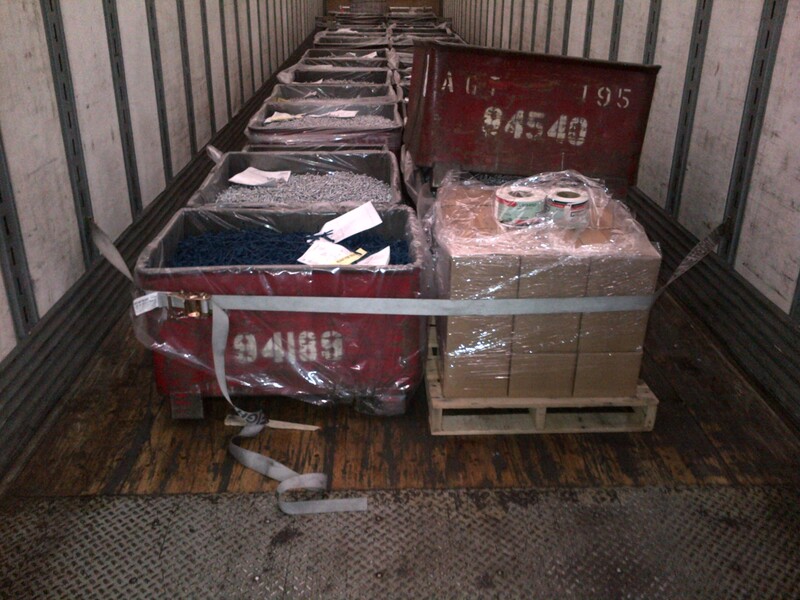 A damaged pallet can cause serious problems during the shipping process. Items can easily become broken or lost when pallets are defective. Another important consideration when it comes to loading a pallet is to ensure that maximum weight limits are not exceeded. Each pallet is certified to a certain weight limit that should be respected through the entire loading and shipping process. Finally, pallets must be handled in the right way using either a pallet truck or forklift. Using the wrong type of equipment to lift a pallet cannot only cause damage but can more importantly result in injury. As an added note, palletized products must be free of moisture and debris and must be properly secured with the right type of securing apparatus. In most cases, strapping as well as stretch wrapping can be used to secure a load. Even tamper-proof tape is often used to secure loads with high priority. For more information on shipping less-than-full-load freight throughout the United States contact us!